When it comes to Wedding favours, the sky's the limit. 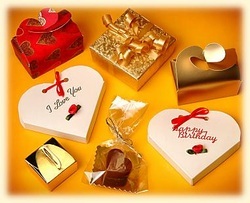 Here are some ideas but bear in mind that many of our other products might also be suitable as favours or celebration gifts. Give us a call to discuss your ideas. You can download the flyer over there ->->-> to get and indication of prices. 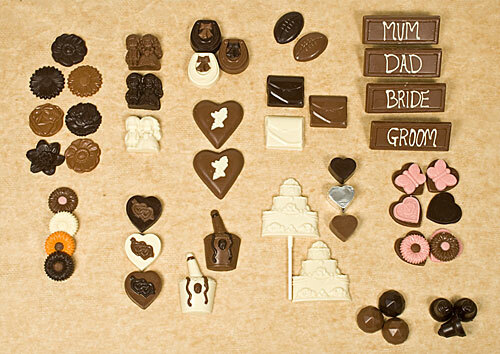 We can make a wide variety of shapes with a wedding and celebration theme. In addition, any of our chocolates can be supplied loose ( if you have sourced your own bags or boxes) or packaged by us in favour bags or boxes. The composite image and slideshow below illustrate some of the figures we can produce. to give you an indication of prices & more ideas.